Kansas center Udoka Azubuike (35) left, readies for a pass from Kansas guard Frank Mason III (0), right, in the Jayhawks 95-57 win against UNC Asheville Friday night, Nov. 25, in Allen Fieldhouse. 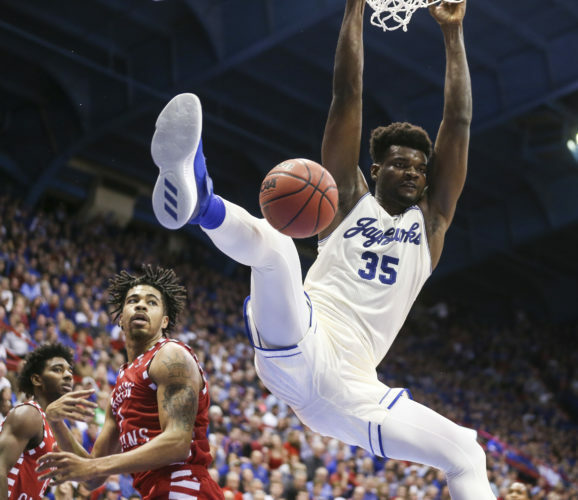 Kansas sophomore Lagerald Vick and freshman Udoka Azubuike both earned the first starts in their careers Friday and made sure to make the most of it in a 95-57 victory over UNC Asheville at Allen Fieldhouse. Vick finished just short of a double-double with career-highs of 15 points and nine rebounds in a team-high 30 minutes. Azubuike was a one-man highlight reel, finishing dunk after dunk on his way to a career-high 17 points on 8-of-9 shooting. He added three rebounds and three blocks in 23 minutes. But career days from Vick and Azubuike were just the appetizer for the No. 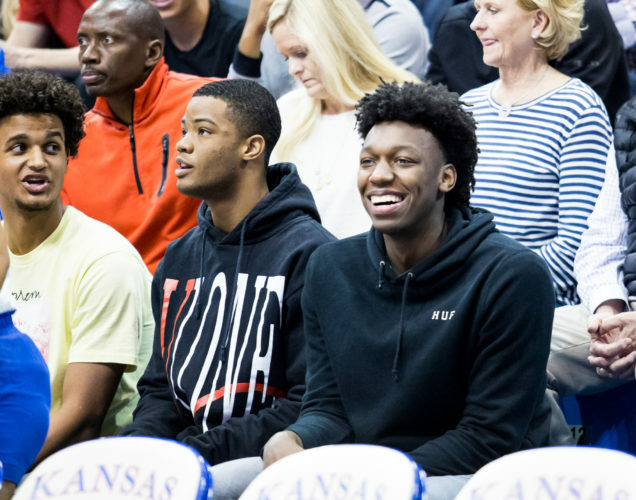 5-ranked Jayhawks. Senior guard Frank Mason scored 21 points on 8-of-10 shooting, including 5-of-5 from behind the three-point line, with five rebounds and five assists. His partner in crime, junior guard Devonte Graham, added six points, six rebounds and a career-high 11 assists. KU freshman Josh Jackson continued his dominant week with 14 points (5-of-11 shooting), seven assists and three blocks. 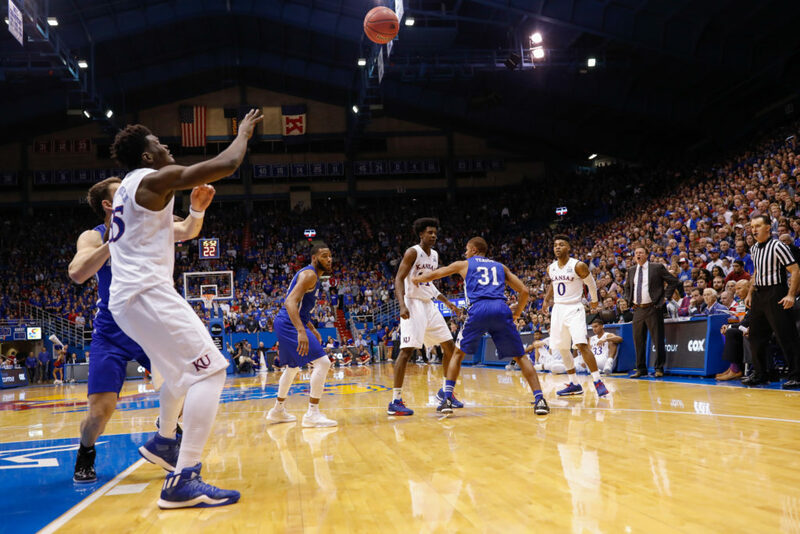 • The game turned when: Midway through the second half, the Jayhawks scored on 11 of 12 straight possessions, shooting a red-hot 10-of-12 from the field. Mason cashed in three triples during the spurt that turned a two-point lead into a 38-19 advantage in about eight minutes. During the stretch, Azubuike had three dunks. One of them, the 7-foot Nigeria native was challenged by 6-3 guard Ahmad Thomas, and he flushed the slam over him for a bucket-and-the-foul. 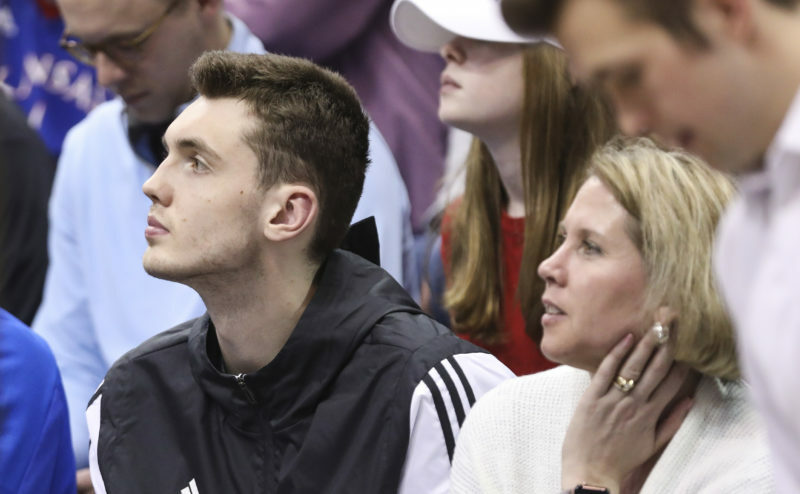 Jackson added four points and three assists in the decisive spurt, finishing an alley-oop after Devonte Graham drove down the middle of the lane. • Offensive highlight: Midway through the second half, Graham showed off how deadly his passing can be for opponents. On back-to-back possessions, Graham tossed alley-oops from behind the three-point line to Azubuike, hyping up the crowd. After Azubuike blocked two shots on the next Asheville possession, Graham made it three straight assists when he found Vick open in the corner for a three-pointer. Graham had 11 assists, setting a new career high after recording nine against Siena last week. 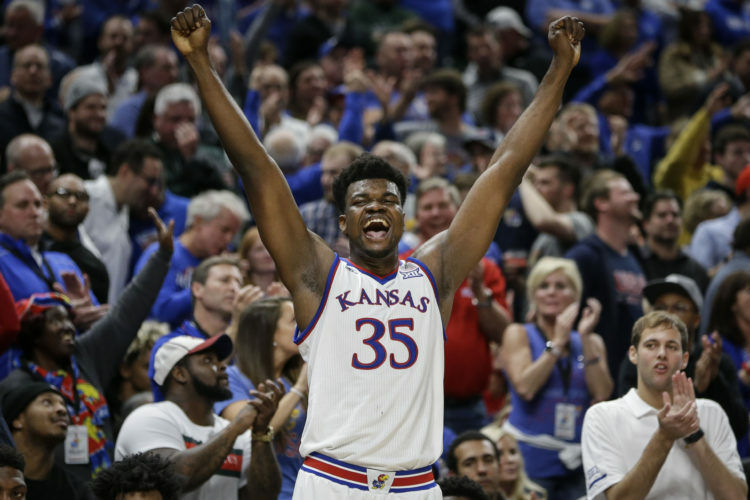 Beyond Graham’s magnificent passing and Azubuike’s earth-throttling slams, Mason scored a game-high 21 points on 5-of-5 shooting from deep — as if his drives and slashes to the rim weren’t tough enough to stop. 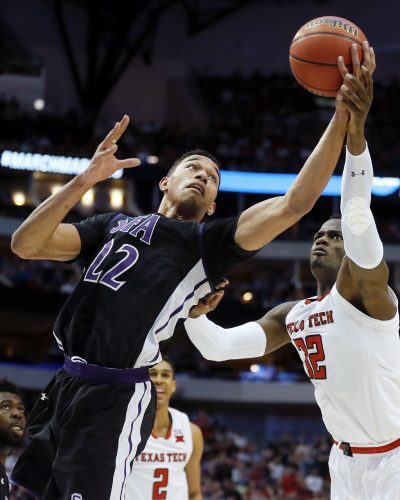 • Defensive highlight: Midway through the second half, Graham reached on the perimeter for a steal, took a dribble and found Jackson streaking to the rim for a big dunk that forced an Asheville timeout and brought the Allen Fieldhouse crowd to its feet. It was a bit of deja vu from the end of the first half. Graham dove for a loose ball and pushed it ahead to Vick from the ground, leading to an open-court dunk for Jackson. KU had four steals, but the two from Graham brought the loudest cheers from the Jayhawk faithful. • Key stat: Shooting percentage. The name of the game is putting the ball into the basket and the Jayhawks were on fire from the floor. 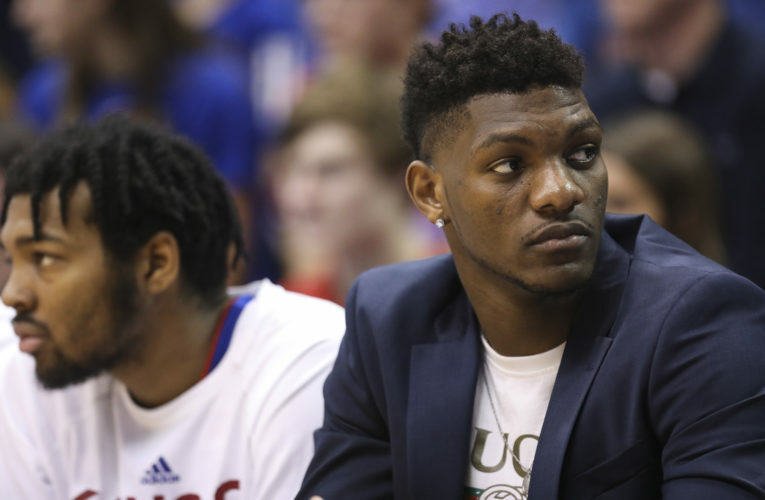 KU shot 62 percent (38-of-61), including a ridiculous 62-percent clip from behind the three-point line (13-of-21). Asheville was held to 36.5 percent shooting. • Up next: The Jayhawks return to Allen Fieldhouse, continuing a string of five straight home games, to face Long Beach State (1-6). The 49ers have played several Power Five schools to open the season, including North Carolina, Louisville, UCLA and Washington. — See what people were saying about the game during KUsports.com’s live coverage.